When I got my groceries at Kroger on Sunday, the Oscar Mayer Wienermobile was parked in front of the store. Seeing that goofy old icon of American culture gave me a smile, and I took a photo to send to my husband, who was at the gym. A few other people were taking pictures of it too. 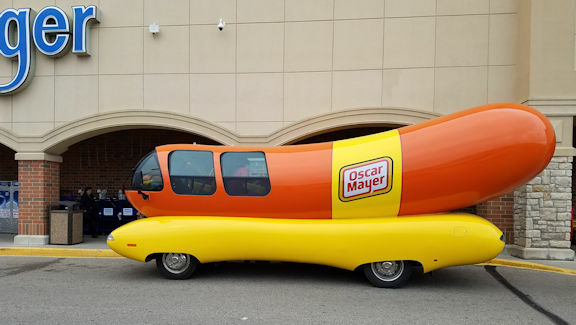 Just out of curiosity, I looked at the company’s website to see how they had managed to keep people interested in the Wienermobile for so many years, when other promotions came and went. I discovered that it now has a tour schedule on Instagram and a phone app with a driving game, among other things. Quite a change from the little trinkets for children that I remember. That’s the way it goes nowadays—in a world where so many things have been changing so quickly, we can’t reasonably expect much to stay constant. As a result, we need to cultivate the skill of letting go and moving on, both in business and as individuals. While that may seem overwhelming, much of the time it’s not really as hard as it seems. We don’t have to transform ourselves into something completely different before we can fit into today’s busy world; it’s more a matter of keeping track of the details and updating them as needed. In that regard, I found the Wienermobile a reassuring sight, in that it’s really much the same as always. Like all vehicles, the technology improves with every redesign, but the main difference is simply that the marketing has changed to keep pace with modern expectations. As often happens, when changes need to be made, they chiefly have to do with communication and finding more ways to relate.